Whether it’s your first time, or you’re an experienced meditator, our meditation classes are suitable for all levels. Our modern approach to meditation doesn’t require you to sit in a lotus position, chant, or stop thinking. We run meditation classes in-house for organisations, at conferences, and at private studios. 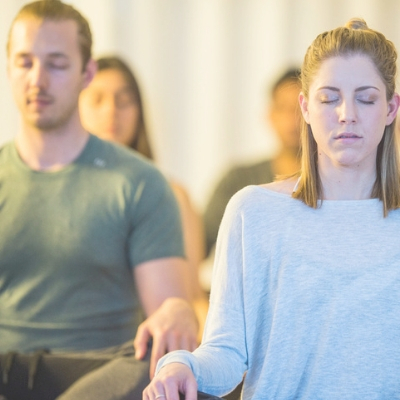 This guided meditation class will help you settle into a deep state of relaxation and calm, enabling you to let go of stress and tension. Perfect for any time of the day to quieten your mind and leave you feeling rested and restored. Learn how to cultivate positive emotions and a greater sense of well-being. Using loving kindness practices to help you develop more compassion towards yourself and others, this class will open your heart and enable you to become less reactive and more responsive with challenging people or situations. This mindfulness based class will help you to practice accepting your emotions, thoughts, and the world around you without judgement. Learn how to focus on your breath to become more present. You will leave feeling centered, focused, and calm. Living with intention allows us to make more conscious decisions throughout the day. In this class you will be gently guided to identify an intention based on how you want to live your life. The teacher will then lead you in a meditation that will help you bring that intention to life. For women who are trying to conceive, or currently pregnant, this guided meditation will leave you feeling deeply relaxed and supported.